I’ve totally stolen this idea from Mike Arrington (of TechCrunch fame and fortune), but it seems every year for the past five he’s put together his top products in Tech that he uses most regularly – and I thought it was such a good idea, I’d jump on the bandwagon and write up my own top products in Tech that I use all the time – only I will limit mine to my top 5. 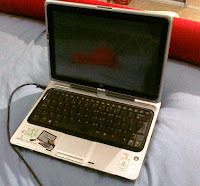 The one item I could never be without – my laptop. Whilst its getting old now (its into its third year of service), it still remains the device that gets used most often and for the most number of purposes. Whilst the machine i s dubbed as an “Entertainment” machine, it really is a good all round machine. Whilst I hardly use it as a tablet – mainly because I can’t get away from the keyboard, I do find myself every now and again pressing against the screen to select items. Over the past few weeks it has developed a bit of a overheating issue but I think that’s only because I tend to use the machine in bed too and often the fans and ventilation points get covered over. I’m hoping like hell that the issue doesn’t develop further – as I really would miss this machine. Earlier in the year I bought a Samsung NC110 Netbook for work, and whilst the netbook platform has really took off these last couple of years – for me a full, proper laptop will never be replaced. Twitter has been around for a good few years now and it seems that I caught the wave just before it really took off and exploded into the mainstream of just about everything; TV, movies, magazines, etc. I reluctantly signed up for Facebook years ago and whilst I think that social platform certainly has its place on the internet, I still find that Twitter is the networki ng platform for me – and I certainly think that it has far more potential within it for further growth into other services and platforms that have the ability to connect the world 140 characters at a time. Just as the SMS text message increased in popularity and took the emphasis away from telephone calls towards text, Twitter has done the exact same thing but to email and Instant Messaging – but is still not yet done. The service could easily be the delivery platform for mobile payments, online e-billing, subscriptions, a real genuine news delivery platform, a competition platform and a lot, lot more. I’ve been actively tweeting all year and whilst I find the service invaluable, I think 2009 really has been a breakthrough year. And part of its appeal and growth has been down to my next item…. The smartphone is one of those essential devices of the day; they can do just about everything you could ever possibly want to do with a miniature computer that fits in your pocket – and its all come about because of the paradigm shift of making applications mobile and an ever connected network of devices/applications/information/people. From a high level point of view, the mesh of all of these things is truly fascinating for me and one I hope to continue to expand. Choosing the right smartphone – at this time of increasingly new models almost on a daily basis - is a difficult task, however for me it was an easy choice this year. It wasn’t Apple, it was the return of a childhood favourite: Palm. Let me get this straight right now – I love this phone. Thought its not the hardware that holds my attention, its the operating system beneath. Palm have worked absolute wonders with the WebOS interface, perfectly combining an OS with the delights of Web 2.0, always on connectivity, in a smooth flowing style. It is an absolute dream to use. Unfortunately for Palm however, their CEO made bold claims about beating the iPhone and those claims had very little foundation which put a lot of people, who were watching the launch of this device, off. Also, the competition grew wider with the adoption of more smartphone devices picking up the Android OS from Google. The Palm Pre was my chosen phone however and I’m positive that it is a solid device and its future is far from over just yet. There is a lot more to come and I’m without doubt that Palm will overcome their initial difficulties, they already have a very interesting application strategy with open source. Time will tell if I am ultimately right in the selection of the Palm Pre or whether I’ll be looking another for platform come my contracts ends in 2011. 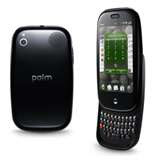 Right now though, my device, the Palm Pre, makes my list. At the start of 2009, I was encouraged by a friend to take up photography after the bug had recently bitten him. Sceptical at first, pondering where I would find enjoyment from such an activity, I dismissed the suggestion that it would appeal directly to me……then I went out with said friend, who brought along his camera. Trudging through a field full of cows and bulls as he snapped away taking photographs I saw a small glimpse of the jo y to it all. It wasn’t until a few months later that the bug bit and I was drawn into finding out more. On my quest, I stumbled upon the new Panasonic Lumix G1 and as the device is smaller than a the traditional SLR camera it instantly appealed as something I’d be able to comfortably carry around and use as I learnt more. Its now a few months later and I have to admit that I was wrong to dismiss the lack of excitement to it all – I’ve been totally drawn in and I can’t wait to take snaps to see what I can create. Whilst I admit I’ve still got a lot to learn, I’ve had few flashes of photos I’ve truly been proud of. 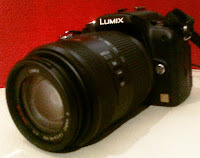 The Panasonic Lumix G1 for its size, features and the pure joy of photography has made my list this year with ease. I don’t think I’ve used a camera as much ever. Finally on my list is the wonder that is Microsoft Windows 7. I never envy the monumental task that Microsoft have to undertake with every iteration of the Windows OS, not only does it have to beat the previous version, but everyone seems to have an opinion about how that should happen and what improvements should be bundled into the release. Anyone who followed along with the “Engineering Windows 7” Blog like I did will have seen a million and one suggestions for things that should be improved or changed and descriptions of exactly how to achieve these – being Microsoft, knowing how to create an OS that relates to everyone and does everything in an efficient and productive, useable way is quite some task. I followed the Beta and the Release Candidate programmes and I eventually purchased two Windows 7 licenses – the first time I’ve ever purchased a Windows license that didn’t come pre-bundled OEM with a new PC or new laptop. It’s a dream Operating System, correcting all of the flaws and complaints from Vista. It works on more hardware (even netbooks), it works flawlessly with media; photos, music, video – I’m a big fan of Microsoft Media Centre for my television viewing and recording. Its a delightful Operating System and something that as a techie I can get really excited about. Radio 2 Make the Best Ads?